You can see where your company spends time using Summary report. It takes all the time entries in your account and groups them by project, client, user, or tag. To open Summary report, hover over Report in the main Clockify sidebar and click Summary. The bar chart shows you the summary of all time entries for each day. It also shows how much of it is billable (dark green) vs non-billable (light green), and you can hover over the chart to see exact numbers. The pie chart shows you the summary of all time entries grouped by project, client, user, or tag. You can click on the + sign next to the group, to expand it and see a more detailed breakdown. 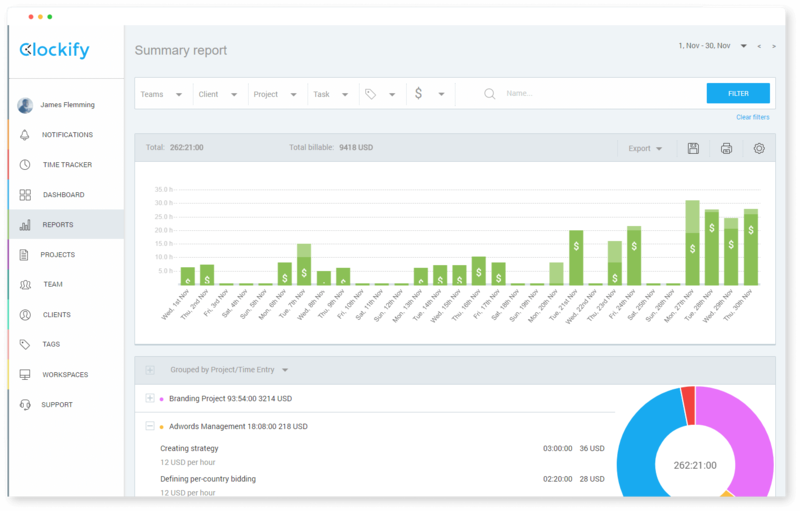 You can group time entries in Summary report by client, user, project, or tag. Then, you can expand the group and see time entries further subgrouped by client, user, tag, time entry, or task. Like in any other report, you can use filters, change timeframe, save and share the report, and print and export the results.